Imam Adeel J. Zeb is an interfaith scholar and Certified Muslim Chaplain. He is the Co-University Chaplain at The Claremont Colleges. 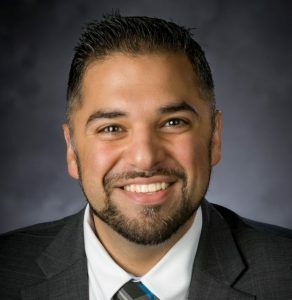 He is the Co-Founder of DEEN: The Foundation for Muslim Campus Life and currently serves as the VP-Elect of the National Association of College and University Chaplains. Previously, Imam Adeel was the Muslim Chaplain/Director of Muslim Life at Duke University. He previously served as the Muslim Chaplain/Imam at Wesleyan University, Trinity College, and American University. He is a graduate of the Master’s in Islamic Chaplaincy program at Hartford Seminary. He holds a Bachelor’s Degree in Business Administration from Baylor University as well as a Bachelor’s of Science Degree in Islamic Studies from Arees University in traditional Islamic sciences. He received certification in Tajweed Qur’anic studies from the Fatih and Blue Mosque in Istanbul, Turkey. He continues to study with scholars from top religious institutions globally. Imam Adeel has over 10 years of experience in Muslim-American public service. He served as a two-time congressional staffer. He has spoken internationally at Islamic centers, universities, hospitals, and Muslim conferences and has delivered Friday Khutbah on Capitol Hill and for the U.S. State Department in Washington, D.C. He has spoken as a plenary speaker at President Obama’s Interfaith Summit. He has earned multiple certifications in Interfaith Conflict Management, Conflict Analysis, and Negotiation from the United States Institute of Peace (USIP). He has published works in the Washington Post, and Temple University’s Journal for Ecumenical Studies. He also writes for the Huffington Post “Religion” section. Imam Adeel was a 2012 Fellow with the Fellowships at Auschwitz for the Study of Professional Ethics. He has led and participated in interfaith and intrafaith international projects in Oman, Trinidad, Jerusalem, and Saudi Arabia. He has appeared on local and national media outlets and has been profiled in the Washington Post as “ the prototype of the American Imam”. His media accomplishments include being profiled and interviewed in the Washington Post, CNN, Time, ABC, CBS, FOX, and Voice of Asia.